Posted March 20th, 2017 by Mike Boyes & filed under Child Development, Early Social and Emotional development, Physical Development: Birth, Motor Skills, and Growth, Prenatal Development. Description: Can you think of a time when someone put their hand on your shoulder in a reassuring manner? Human touch is a positive experience. What about newborn infants? Or what about preterm (premature) infants in Neonatal Intensive Care Units (NICU’s)? how might touch relate to development? Think about it and then read the linked article for some research findings bearing on this question. Source: A prescription for touch: Early experiences shape preterm babies’ brains, Cell Press, ScienceDaily. Touch maters. While the article author does not report on it preterm infants that are given opportunities for “kangaroo care” (skin to skin contact with their parents, gain weight faster and move more consistently towards their important development goals than infants without contact. Touch may not just be reassuring and “nice” it may be a core part of early development. What sort of touch is the article referring to? 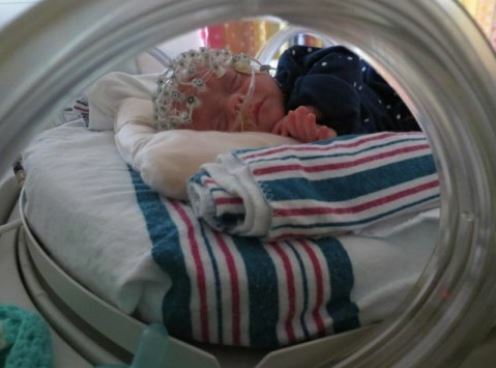 Why might touch be particularly important for preterm infants? How might NICU’s and maternity words be organized to support early touch? Harrison, L. L. (2001). The use of comforting touch and massage to reduce stress for preterm infants in the neonatal intensive care unit. Newborn and Infant Nursing Reviews, 1(4), 235-241. Modrcin-Talbott, M. A., Harrison, L. L., Groer, M. W., & Younger, M. S. (2003). The biobehavioral effects of gentle human touch on preterm infants. Nursing Science Quarterly, 16(1), 60-67. Weaver, M. (2017). Healing Touch: Positively Sharing Energy in a Pediatric Hospital. Journal of Pain and Symptom Management.